The sallyport of Fort Carroll viewed from the outside, with the ruins of the stone quay in the foreground. Note the cannon imbedded in the quay on the left. Baltimore, Maryland has been a significant seaport since well before the American Revolution. Today, commerce continues daily as ships steam up the Patapsco River and pass under the soaring structure of the Francis Scott Key Bridge, crowded with trucks and cars from Interstate 95. Few of those in the ships or in the vehicles pay much attention to a large dark hexagonal bulk sitting in the water just to the southwest of the Key Bridge. 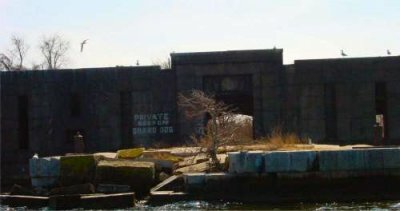 Long abandoned and forgotten, this nearly three and a half acre man made island of brick and stone was once a symbol of American military might and engineering ability—Fort Carroll. Fort Carroll’s origins date to 1847, when the State of Maryland gave permission to the United States War Department to construct a fort in the shallow water of Soller’s Point Flats to protect the city of Baltimore. Britain’s invasion of the Chesapeake in the War of 1812 had shown that forts like Baltimore’s Fort McHenry were too close to the cities they were meant to defend. A new plan for fort construction, called the “Permanent System’ (also known as the Third System) intended to defend America’s most important seaports and prevent another invasion from the sea. Under the supervision of a young engineer named Robert E. Lee work crews began driving piles into the water and building the foundations for the giant fortress. Eventually Lee moved on to become superintendent of the United States Military Academy at West Point, while construction proceeded slowly, hampered by lack of funding and the difficulty of building such a heavy structure on soft sand. On October 8, 1850 the fort was officially named after Charles Carroll (1737-1832), a Maryland political leader and the last surviving signer of the Declaration of Independence. In 1853 a lighthouse was added atop the fort’s parapets. The original design for the fort included three levels fitted for cannons, totaling between 250 and 350 guns. By the coming of the War Between the States (often erroneously called “The Civil War”) Fort Carroll was only partially finished, its walls less than half the height they were designed to have. Still, about thirty cannon were put in place and throughout the war Fort Carroll was fully manned to guard Baltimore harbor. In April 1864 torrential rains flooded the fort’s magazines and all the powder and ammunition were moved upriver to Fort McHenry. After the war Fort Carroll languished, its walls slowly sinking further into the sands of Soller’s Point Flats. With the coming of the Spanish-American War in 1898, the Fort’s now-obsolete batteries were again fully manned, and construction began on putting modern artillery in place. The resulting concrete gun emplacements were designs from the “Endicott System,” named the head of the board which evaluated American coast defenses following the War Between the States. The Army built several modern gun batteries, including fifteen-inch, twelve-inch, and ten-inch guns (similar to the armaments being carried by battleships) as well as eight-inch and five-inch guns. The new guns were ready by September 1900, but by then the war with Spain was long over. At the onset of World War One the Army removed some of the guns and 1920 had put all remaining weaponry to use elsewhere. The realities of modern war ensured the complete obsolescence of a fixed fort so far up the Chesapeake Bay. In March 1921 the Army officially abandoned Fort Carroll and moved all remaining military equipment to nearby Fort Howard. Fort Carroll now sat unused and forgotten except for its lighthouse, and even that had been automated in 1920. Plans were proposed over the years to se the fort as the base for a giant statue, just as the Statue of Liberty had been erected on the remains of Fort Wood in New York harbor. Other plans included using the fort as an island prison like Alcatraz or as a museum. The Army and Coast Guard both used the interior of the fort as firing ranges briefly, but in 1958 the entire fort was sold to Benjamin N. Eisenberg for just over ten thousand dollars. 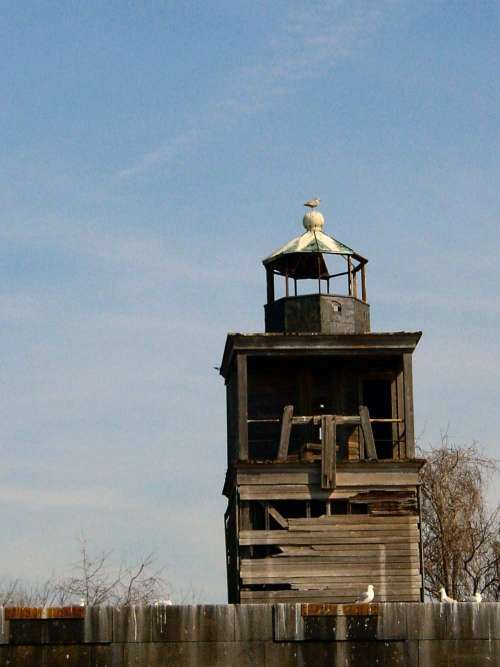 Eisenberg hoped to turn the Fort into a casino, but the plan fell apart when he discovered that the fort was just outside the boundaries of gambling-tolerant Anne Arundel County. Eisenberg still spent a great deal patching up the Fort’s neglected walls, planting peach trees and keeping the interior landscaped. In 1964 real estate developer Robert L. Jackson leased the fort and used his private passenger hydrofoil, the Baltimore Clipper, to ferry guests for picnics in the unique surroundings offered by the fort. Soon this plan was abandoned, too. Rumors persisted of development plans through the years, but in the meantime trees, vines, and weeds engulfed the fort’s interior and the effects of wind, rain, and time eroded the brickwork and concrete. Thousands of birds nest there, and the Forts walls are covered with guano and bones. In October 2000 developer Bill Struever signed a new lease form the Eisenberg family, declaring his intention to “preserve this terrific piece of history,’ and “protect the site from neglect and decay.” Nothing came of this man’s ambition, either. Two other forts built to a similar design at about the same time, Fort Sumter in Charleston harbor and Fort Pulaski near Savannah Georgia, were the scenes of combat during the War Between the States. The United States Park Service now preserves them as important historical sites. Meanwhile Fort Carroll, a victim of obsolete technology and obscurity that never fired a shot in anger, continues to sink into the sand and mud. 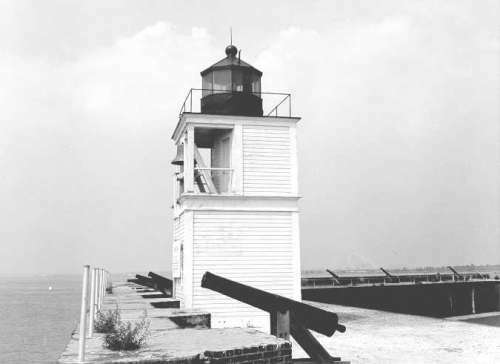 In 1854 a lighthouse was built on the ramparts of the fort to warn vessels away from the construction site and to mark the turn form the Brewerton Channel to the Fort McHenry Channel leading in and out of Baltimore Harbor. The lighthouse keeper lived in a separate structure on the grounds of the Fort. In 1898 a new lighthouse was built, the one still seen today, and it was automated in 1920 and then discontinued sometime between 1931 and 1945. The lighthouse in better days surrounded by the fake concrete cannons. Find an error? Have an idea or suggestion? I would like to hear it. Send us an email. Copyright 2002 by Brian Hawley and Alex Cheek. All materials published here are from the Brian Hawley collection unless otherwise noted. This site and its related contents are published strictly for educational purposes. Do not steal the images from this site for your own web projects! If you ask nicely I will be glad to share images as long as proper credit is given.